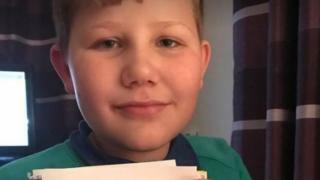 Gary Barlow has invited a nine-year-old fan and his mother to his concert after the boy wrote to him saying he could not get a ticket. Zachary Simmons mother Samantha was 164th in the queue when 6,500 tickets went on sale on the Eden Sessions website, but they sold out in minutes. In the letter, Zachary said he was angry people bought tickets just to sell them for a profit. "When Zak found out he could go, he burst into tears," Ms Simmons said. Ms Simmons, from Redruth, Cornwall, said her son wrote the letter because he wanted to tell the singer that genuine fans were missing out. "I was upset at not getting the tickets, which were to be part of Zak's Christmas present, but I was even more upset at having to tell him," she added. "He was upset, but when I explained why we didn't get the tickets, he got angry and frustrated and said it was wrong that real fans were missing out." After Ms Simmons posted Zachary's letter on social media, where it was shared a number of times, Barlow tweeted: "I'd love this young man and his mum to be my personal guests for the show." "We really weren't expecting that reply, because he must get this all day, every day," Ms Simmons said. Zachary said he was "thrilled" that he can go to the concert in June, but he still wants the system to be changed so it is fair and fans do not suffer. The Eden Sessions said there had been a "massive" demand for Barlow tickets at what was a "relatively small venue". It said tickets sold out as quickly as any sold to date and the unprecedented demand meant that even people high up in the queue were not successful. "In light of the feedback we are looking at ways to make our 'all tickets sold' messaging on our booking system faster and clearer in future," a statement added.